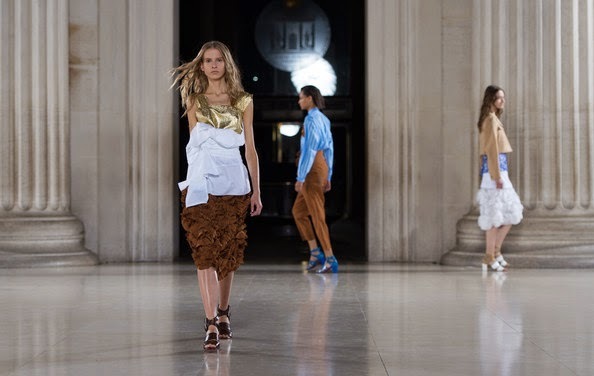 Glaswegian Jonathan Saunders’ Spring 2015 featured Japanese inspired clothing with a strong and feminine woman in mind. Perhaps Scarlett Johansson in ‘Under the Skin’ - the movie’s score served as the soundtrack for the show at the Britain Museum. One of my favourite looks in the collection was Look 9, worn by top model Binx Walton. A pale blue collarless shirt with white stripes, featured a brown overlapping leaf motif decorated with a gold embellished branch. High waisted trousers tied at the waist showed off the Japanese undertone in the form of origami. Mixing different materials and textures was perfectly executed in the 39-piece collection. The looks with a hand painted colour-blocked cotton voile were my favourites. Jonathan doesn’t conform with most designers and is his entirely his own entity which I love and respect.